After so many cancelled races due to flooding, high winds, flooding and yet more flooding, it was with great relief that the club was able to enter eight crews at Lincoln Head, a 3000m upstream race on the River Witham. Not only was the race on, but the weather held and the sun shone for both divisions. The excitement of the day however was a forty minute delay to the start of racing as two barges tied together declined to remain at the start and proceeded very slowly to chug up the course eventually past the armada of boats waiting to race. Keith and Charlie were so entertained they fell asleep for half an hour much to the amusement of the younger crews surrounding them. In the first division we had the Ladies Masters D Eight of Emily Quinton, Emma Heygate, Kate Henry, Rachael Tarlinton, Karen Senior, Di Hope-Cokayne, Sandra Martin and Jen Smith, coxed by Jerry Heygate who were out for their first race having only recently formed as a crew again. 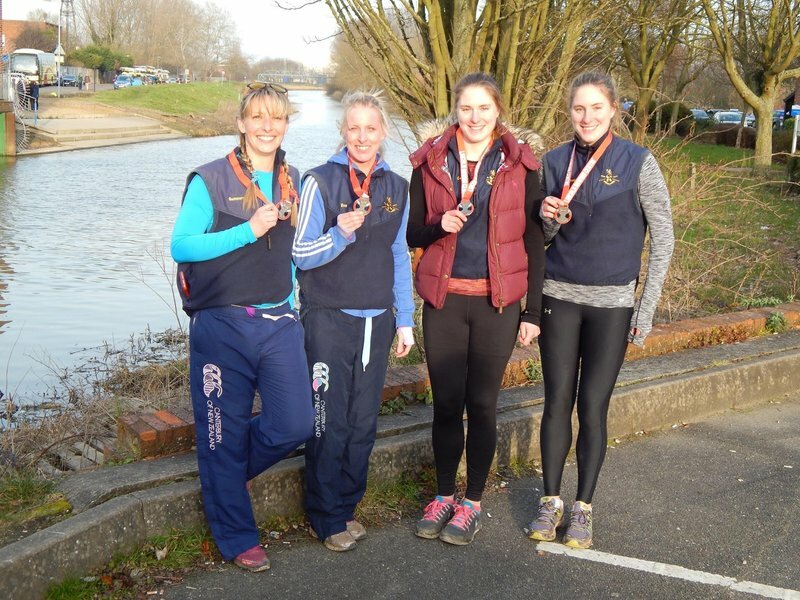 Despite their opposition being a composite crew of the best female masters rowers from Leicester, Peterborough and Nottingham, they performed well and were delighted with the overall time they got of 15mins and 58 seconds, coming in second. Fellow Masters Vicky Haines and Heidi Janicke rowing as Masters C were up against Zoe Hudson and Erica Gummery rowing as Masters B in the pairs. Zoe and Erica took the medals in an amazing time of 15 mins and 20 seconds, and were the fastest ladies pair on the water for the day. The Men’s Masters C double of Mike Targett and Scott Ferris, managed a very respectable 15 mins and 44 seconds coming in third place, with their winning opposition a formidable Leicester crew which came seventh in the whole competition – one of them being a world masters champion. Fellow master rowers Keith Hudson and Charlie Henry came second in their Masters D pair in 14 mins and 55 seconds with Emma and Jerry Heygate following them in third place. More medals were won by Cathy and Annie Beaumont in their elite double as they completed the course in a terrific time of 14 mins and 56 secs. 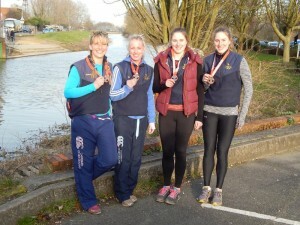 Finally in the second division was a new crew of IM3 ladies comprising of Zoe, Erica, Annie, Cathy and brand new rowers Charlotte Shields, Sophie Glazik, Ellena Cartlidge and Jennifer Taylor who had a fabulous first head race coming in second to Newark in a time of 14 minutes dead. Once again, a big thanks to Keith for driving the trailer through the thick early morning fog to Lincoln and all those that were there supporting whilst picking up a suntan.